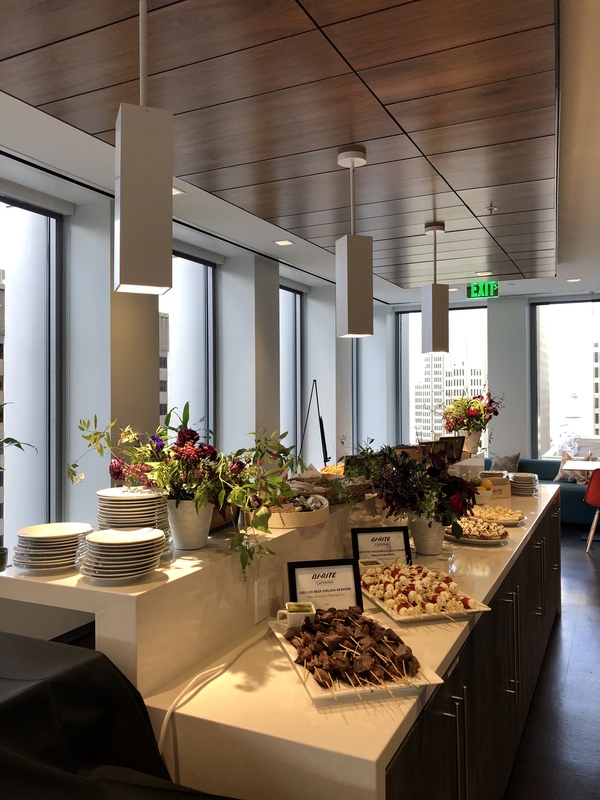 Last week SHIFT San Francisco hosted an open house to celebrate our new location in the heart of the Financial District at 456 Montgomery Street. SHIFT’s office resides on the 15th of 23 floors and features iconic views of San Francisco landmarks. Coit Tower. The Transamerica Pyramid building. The Bay Bridge, Ferry Building and Chinatown. We have a bird’s eye view of them all. 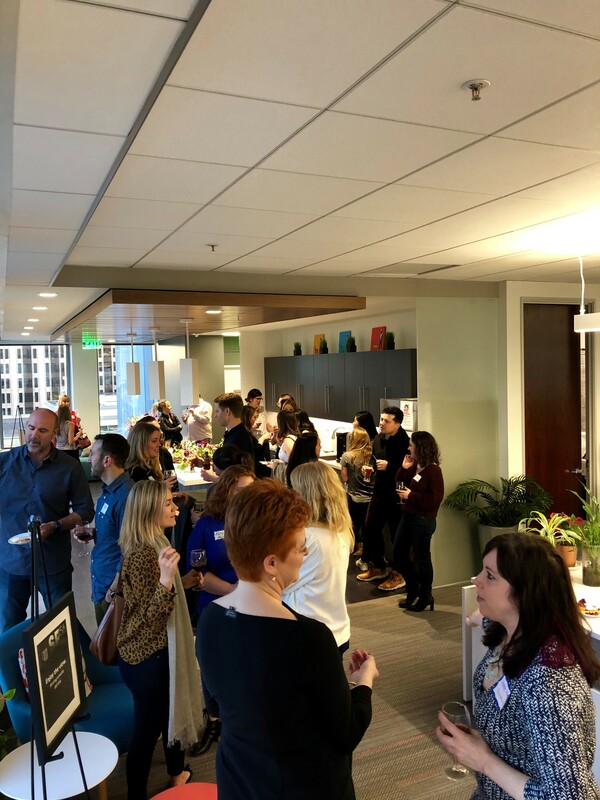 More than a dozen SHIFTers currently work in this sweet space, which we share with teams from Avenir Global sister agencies, FoodMinds and Padilla. The open, spacious layout lends itself to a naturally collaborative work environment. Our open house attendees included guests from throughout the Bay Area, across the country and even Canada. 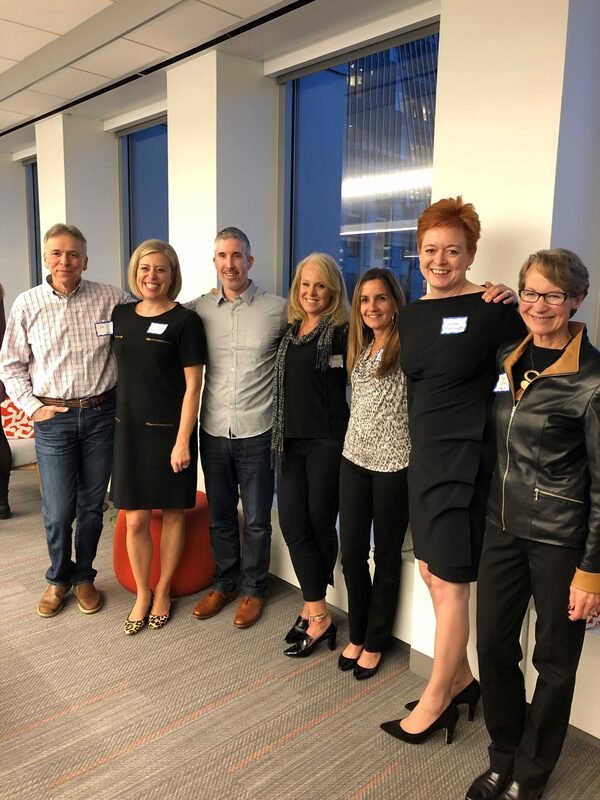 Past and present clients of SHIFT, SHIFT leadership including Amy Lyons, Jim Joyal and Paula Finestone, AVENIR GLOBAL EVP Valérie Beauregard, Padilla Chair Lynn Casey and more, came to celebrate our recent move. We are thankful for their attendance and appreciate their support of our event. The evening was full of great conversations and networking as well as yummy food and wine catered by Bi-Rite. Guests enjoyed a solid spread of appetizers – the roasted red pepper hummus tartlets and delicious turkey and pesto finger sandwiches were my favorites. We also had plenty of SHIFT swag – branded notebooks, pens and keychains as party favors! The two hours flew by; everyone had a great time. 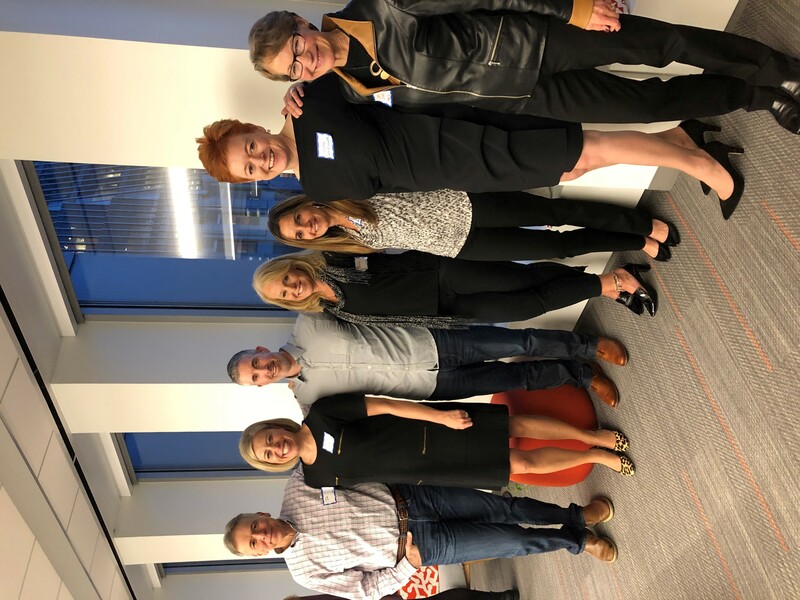 We are thrilled we had the opportunity to spend time with our connections while showing off our beautiful space. Our new office has a very modern and bright theme and is complete with five conference rooms of various sizes. On a daily basis, we eat lunch, make several pots of coffee (so much coffee) and mingle in our kitchen that typically has some kind of homemade treats. We also have a colorful den area, with couches and a television, that holds our biweekly “Pub Club” where we share interesting articles we’ve recently read. The walls of the office are lined with floor to ceiling windows, which make the sunny days extra enjoyable and, in a city as amazing as San Francisco, there’s always something new to see from up here. San Francisco’s Financial District serves as the city’s center of business. Complete with skyscrapers, cable cars, the newest hot spots and the oldest restaurants, there are unlimited places to explore in the neighborhood. We love being in a location where we have the opportunity to do “Healthy SHIFT Friday Lunch Walks” where our team ventures beyond the usual two-block radius to try a new lunch spot while enjoying fresh air together. The convenience of our location also allows nearly half of our office to easily commute using BART and also made it possible for our team to walk to a performance of SF’s famous “Beach Blanket Babylon” for our holiday outing in December. 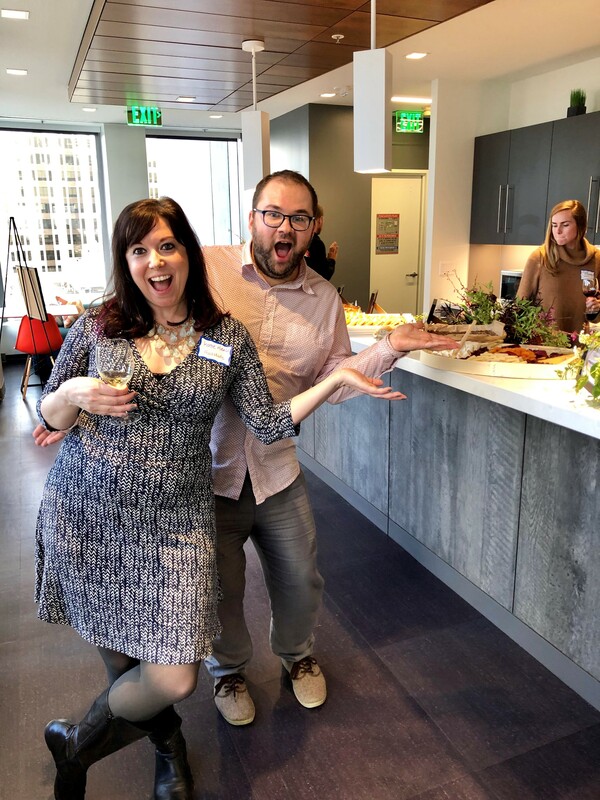 Check out and follow our Instagram to watch the “SF” office highlights and stay updated on all of the fun going on at 456 Montgomery! We are all excited about the hard work, memories and fun our office has yet to experience. Thank you again to everyone who attended our open house party and all of the people that made it possible. P.S. Inspired by our space? Come join us, we’re hiring!